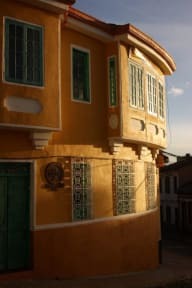 Our house is a beautiful construction, years of history make it part of the architectonic patrimony of the city of Bogot (Our house has been restored, however it's structural integrity remains). We have 4 rooms at your disposal, all of them with a stunning view of the surroundings, balconies and ample windows. Staff was very kind and helpful. I will revisit this place one day. Lovely family hostel with totally adorable people in a great location very close to everthing. Very clean and absolutly recommended! 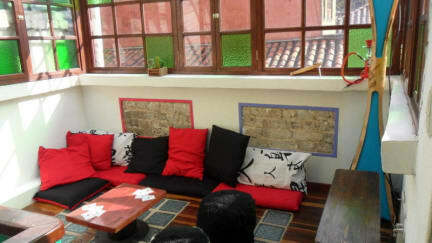 One of the best hostels we have been in colombia. Staff and atmosphere are really good!! Sehr gemütliches Hostel mit tollem Frühstück! Great place, staff very helpful, bathroom is a Bit small and unfortunately the bathroom-sink is visible from the Kirchen Area, not at Lot of privacy. But still a very charming place. The Location is great. Would stay there again! The Staff was very friendly and helpful. They suggested us restaurants and locations, you don't find in Lonely Planet etc. We enjoyed the stay. A possibility to buy beverages at the hostel would be nice (e.g. Cola, beer...). I was feeling very bad if i arrived in bogota... but wirh this friendly stuff at the hostel... also the owner I feel a lot better... the atmosphere is great. Also the hostel I liked the house . It was clean with really hot showers...the owner was very helpful and lovely. The beds where comfortable . Good, pretty place up I'm Candelaria, good Location to walk around the city. Beautiful rooms, plenty of blankets, most of the staff don't speak English though. We're able to arrange taxis to the airport very early in the morning through the hostel. Showers are hot, okay breakfast, mattresses also okay. Stayed here twice, would do so again. Good value for money. Kleines Hostel in der Altstadt. Bei Koreanern sehr beliebt, warum auch immer. Sehr freundliche Mitarbeiter, ordentliches Frühstück mit Croissants, Küche voll ausgestattet, Bäder immer sauber. Es gibt leider nur zwei Toiletten/Duschen die auch noch direkt neben dem Wohnzimmer/Küche liegen und nach oben offen sind. Dafür aber immer heißes Wasser in den Duschen :) Zimmer sehr hellhörig und ziemlich kalt in der Nacht.